Are you thinking of doing a bus travel in Ecuador? When I first arrived in Ecuador and took a day bus to Mindo, I was shocked to find my beloved Canon G7 missing from my backpack even though I’d been keeping a very watchful eye on my bag. Six years later, while sitting at a foreigner-friendly café in La Floresta, I overhear people lamenting over lost possessions all the time. Petty theft is, unfortunately, a part of life in Ecuador, especially if you’re a tourist (aka a walking target…). Especially if you travel by bus and don’t quite know the tricks to staying safe in Ecuador. And, while bus travel through Ecuador has its “ugly” side, for every drawback you might encounter, there are innumerable benefits to journeying onwards and exploring this incredible land. In the following blog, we’ll discuss some of the pros and cons to bus travel in Ecuador, ways to mitigate disaster, as well as an excellent alternative to bus travel in Ecuador that EVERY traveler should know about. As a travel company in Ecuador, Wanderbus has no interest in scaring visitors off with stories of theft and safety hazards. We adamantly believe Ecuador is a safe travel destination. That said, we must also acknowledge the risks that do exist, especially those associated with bus travel in Ecuador. If you’re planning to travel by bus, be weary about your documents (passport), money and valuable possessions in bus terminals and buses. These are the places where you’re most likely to “lose” items. In bus terminals, there’s usually a lot of commotion and it’s easy to get distracted, providing a perfect opportunity for opportunistic individuals. If you’re ever at a bus terminal, try to be alert, erring on the side of paranoia, for a while at least! Don’t slip your phone into your back pocket, always keep it in a pocket with a zipper and, if possible, in your hand (inside your pocket). Don’t take out large bills. Keep a $10 and a few coins handy. Whatever else you have should be stashed away deep in your pocket or money belt. Don’t take out cameras, passport or anything else of value while in public. Always keep your bags with you, even if you’re going to the bathroom. Don’t assume your possessions are safer on you. Sometimes things are safer in the storage compartment below. If you have a typical backpacker’s backpack, consider camouflaging your bag by wrapping it in a trash bag or putting it in a regular looking duffel bag. Although this should be avoided, if you bring a smaller bag (or other possession) onto the bus, place it in the above storage compartment, across the aisle and a few seats ahead of you so you have a clear view of your bag during the trip. If the bus starts to get too crowded (people standing in the middle aisle), your bag is safer in your hands, but NOT below your seat. From Quito, there are two main bus terminals: Quitumbe and Carcelén. Quitumbe is a larger terminal in the South of Quito and over 120 bus companies depart from here to dozens of destinations around Ecuador (and internationally) on a daily basis. If you’re not sure which terminal to go to, go to Quitumbe. You might have to wander around for a while and even wait for several hours, in some cases, but you’ll eventually get on a bus to your destination. Here’s a likely outdated bus schedule for Quitumbe. Carcelen is located in the North of Quito and is a much smaller bus terminal with fewer companies and destinations, but it’s much less chaotic and still offers a variety of options. Here’s a likely outdated bus schedule for Carcelén. The disadvantage to all of this is that you can’t purchase any tickets in advance or online. Even the most popular bus companies, like TransEsmeraldas, don’t let you reserve your ticket by phone. You literally have to go to the bus terminal to buy your ticket, and since both of these terminals are all the way north or south, you’ll probably end up waiting around until your bus departs. Waiting around in a bus terminal is not only uncomfortable, but increases exposure to safety risks. 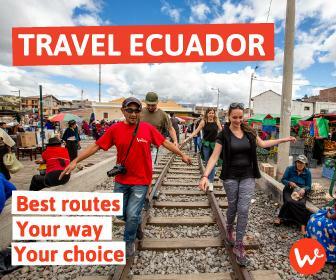 In a recent Q&A interview, Wanderbus Owner and Founder Nico Ponce described Ecuador’s transportation system as “geared to locals”, not tourists. From Carcelén or Quitumbe you can basically get ANYWHERE you need to by bus. However, most tourists want to get to specific destinations, like the entrance to a National Park or a small surfer town. Though you’ll get there eventually, the journey may require hopping on/off 4 different buses and long waits in isolated bus terminals at ungodly hours. I won’t comment on the potential state of the bathrooms. Ecuador is probably one of the cheapest countries in South America to visit and travel through by bus. For every hour on a bus, you’re paying around $1-$1.50. 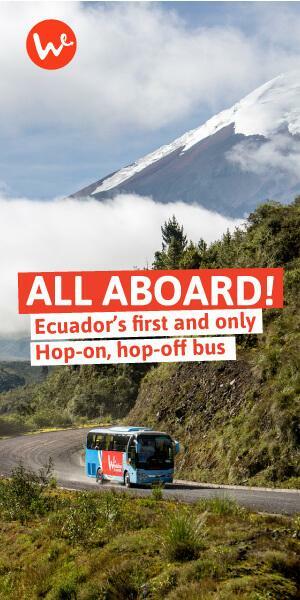 In fact, it’s so cheap, traveling by bus through Ecuador is usually worth the chaos and wait times at the bus terminals (That is, until your phone gets stolen!). Bus travel in Ecuador is SO cheap, you’ll probably spend more money getting to the bus terminal by taxi than getting from the bus terminal to your destination. I think I’ve made my point: It’s cheap, so take advantage of it! Travelers come in all shapes and sizes, and the ones that travel by bus are, by far, the coolest. Some travelers land at the airport only to hop on another plane to get to their next destination. They buy luxury, packaged tours and never interact with local Ecuadorians (apart from their guide). These travelers aren’t really experiencing Ecuador or departing from their comfort zone. Then there are those that dive in deep. They’re picking up new phrases in Spanish or Quechua, they’re eating street food (#sorrynotsorry) and traveling to all their destinations by bus. By doing so, they’re defying their comfort zone and experiencing the real Ecuador. Bus travel in Ecuador lends itself to a more authentic experience, despite the associated risks. By traveling by bus, you’re exposing yourself to uncomfortable experiences and interactions, but you’re also accessing conversations and friendships you might otherwise never experience. Traveling by bus frees you of responsibility. Yes, it can be annoying sometimes, but who cares?! All you have to worry about is where your stuff is and what you put in your mouth (referring to street food, again). If you were to rent a car, you’d be concerned about how to get to your destination, where to park and what to do if it gets robbed. Whereas, if your bus breaks down, you’ll probably grumble and then just get on the next bus. While you’re on the bus, you have time to spare. You can read, journal or talk to the person next to you. And by bus, you can get to almost ANY destination. In Ecuador, the government is required to provide transportation wherever there is a community of families. And since there are people almost everywhere, there are buses almost everywhere. A certain degree of flexibility may be required to travel by bus, but ultimately, it’s a liberating, responsibility-free experience. Now it’s time to weigh some of these pros and cons. Actually, what if I told you there was a wanderful alternative you wouldn’t be able to pass up that will give you the best of both worlds? 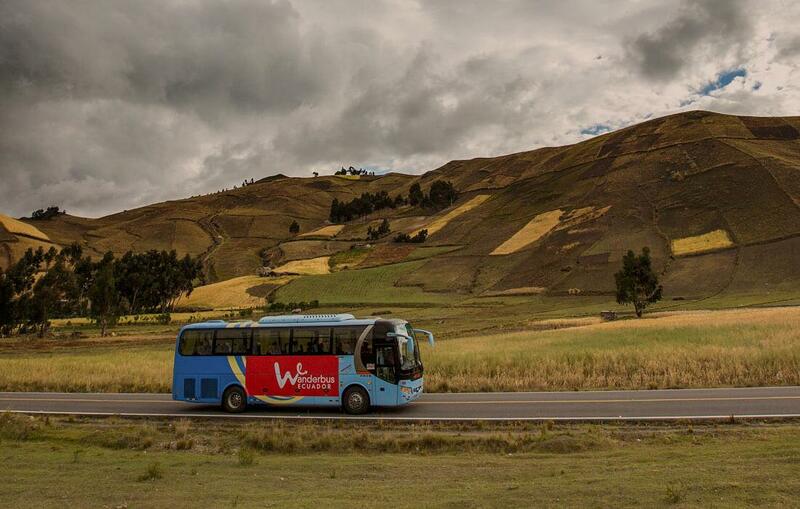 The Wanderbus addresses nearly all the problem areas around bus travel for tourists in Ecuador. It provides a safe, hassle-free experience while also getting you directly to your top destinations. You can book online to skip wait times and, most importantly, you’ll still have an authentic Ecuadorian experience. On the Wanderbus, you’ll visit markets, eat cheap, regular food and interact with locals. That is, if you want. You can also just keep to yourself while still taking advantage of this affordable, safe bus travel option. Forget about having to look over your shoulder while hanging around bus terminals for hours on end. The Wanderbus has a handful of centrally located hop on/hop off locations in each city, saving you time and stress. Safe. Convenient. Fun. Have we sparked your curiosity? Check out some of the Wanderbus passes here to see if it fits with your travel plans. Hi Chuck, this is Diego from the Wanderbus Team. If you like train travel, you should definitely want to check the Devils Nose Train Adventure, check our article: 5 things you should know before riding and feel free to chat with our team if you need any assistance planning your trip.